From time to time we all have problems with our computers deciding to take a holiday and this past week has been a “week that was” for Tony Woods, so I offered to prepare this article on his behalf for your enjoyment. 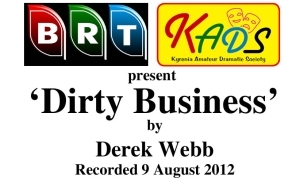 This year’s annual Radio Play offered by the Kyrenia Amateur Dramatic Society (KADS) was the hour long comedy “Dirty Business” by Derek Webb. during July before attending the BRT studios in Nicosia on 12th August to record it under the careful control of the ever smiling Can Gazi. This, the ninth collaboration between KADS and BRT, had in its cast: Natalie Ratcliffe as Josie; Wyn Harrison as Angela; Steve Sydenham as Roger; Stephen Sydenham as the Narrator and Anita Woods as the Announcer. Sound Effects and Editing was by Erol Ziya and Studio Production was by Can Gazi. BRT announced the two transmission times and dates and all was over – until the next one. The comedy took its plot from the future cutbacks in a local authority requiring it to outsource the cleaning department…something the cleaners were determined to prevent happening even if it meant… a little “Dirty Business”. shown and double click on the play link to listen to it. There are some great shows to listen too..
On behalf of all that have enjoyed KADS plays may I voice a vote of thanks to all of those listed above, their fans and a special thank you to Tony Woods and Şirin Damdelen for their photographs which have been included in this article that help bring the recordings alive. Great Site. Thanks for posting. Thanks for visiting our site, please do call again. The KADs radio play “Dirty Business can now be heard by clicking on the link above. Do select your choice, listen and enjoy!